Junes’ warmer weather means cookouts with family and friends. To complement those delicious entrees on the grill, bring something healthy that will not spoil in the heat and that everyone can enjoy. 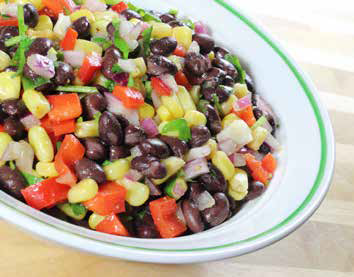 Our Black Bean and Corn Salad is gluten free and diabetic friendly, low calorie, and packed with fiber and vegetable protein. It’s great as a side dish and can also be served with baked, reduced-salt tortilla chips for a tasty appetizer. Mix all ingredients and chill overnight to let flavors meld. Taste and add additional seasonings if desired. Per serving (not including optional baked tortilla chips): 148 calories; 3 g fat (17.3% calories from fat); trace saturated fat; 7 g protein; 24 g carbohydrate; 7 g dietary fiber; 0 mg cholesterol; 462 mg sodium. Diabetic exchanges: 1 1/2 grain (starch); 1/2 lean meat; 0 vegetable; 0 fruit; 1/2 fat. This recipe is vegan, vegetarian and gluten free. Note: If watching sodium, use low-sodium or no-salt canned beans and control the added salt in the recipe to meet your needs. — Recipe courtesy of LowFatLifestyle.com. For more free recipes and healthy-cooking tips, visit www.lowfatlifestyle.com.